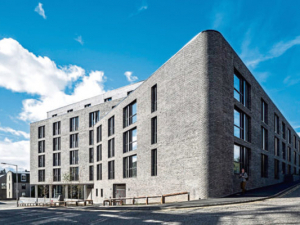 The scheme was to redevelop the site into a modern and bespoke 8 storey student accommodation block with associated management facilities and amenties. The accommodation houses approximately 270 students in 196 ensuite and non-ensuite units, ranging in mix from two to nine bedroom cluster flats. The development was proposed to be a zero car development and has limited car parking availability. There is secure cycle parking provided on site and a landscaped courtyard offering secure and sheltered amenity space at the heart of the building, away from the busy surrounding streets. There is a degree of permeability through this courtyard, with both a main entrance from Powis Place and a secondary entrance from Canal Road offering glimpses of the interior. All the main circulation stairs are accessed from the courtyard, ensuring that the space is lively and well used. Winner of the RIAS Award for Best In Residential Category.